What Do Washing Machine Settings Mean? In the past few years, washing machine technology has advanced by leaps and bounds, and current models are stylish and sophisticated machines that are as complex -- and complicated -- as luxury cars. This pursuit of perfection has eliminated the simple three-step process of the past (load machine, add detergent and push start) and replaced it with an extensive user-interaction process that requires making multiple decisions, ranging from deciding the appropriate water level and selecting the correct temperature setting to sorting through an array of cycle settings to choose the one that will yield the best load of laundry. Choosing the right settings will prevent shrinkage and color fading. Many washing machines have three water level settings: low, medium and high. When washing a small amount of clothes, select the low water level; with an average amount of laundry, use the medium setting; and for large laundry loads, select the high water level to ensure there is a sufficient amount of water in the machine to thoroughly clean your clothes. The correct temperature setting is important to retain both the color and shape of fabrics. Hot water is best for white laundry items such as underwear, socks and linens. Warm water is conducive to cleaning permanent press and other wrinkle-resistant fabrics and also prevents color-fading. Cold water is good for preventing shrinkage and works well with dark colors and delicate items. Some machines have combination temperature settings like hot/warm, hot/cold, warm/cold, which designate the wash and rinse cycles respectively. For example, selecting hot/warm means the clothes will be washed in hot water and rinsed in warm water. The "Normal" or "Regular" cycle is used for regular loads of laundry that don't require special handling or intensive stain treatment. "Permanent Press" is used for wrinkle-free fabrics such as dress shirts. According to WardrobeAdvice.com, this cycle cools clothes before they enter the spin cycle -- which prevents creasing and wrinkling -- and cleans without unnecessary harshness for laundry with an average amount of dirt. The "Delicates" setting is for fine fabrics such as lingerie and silk. 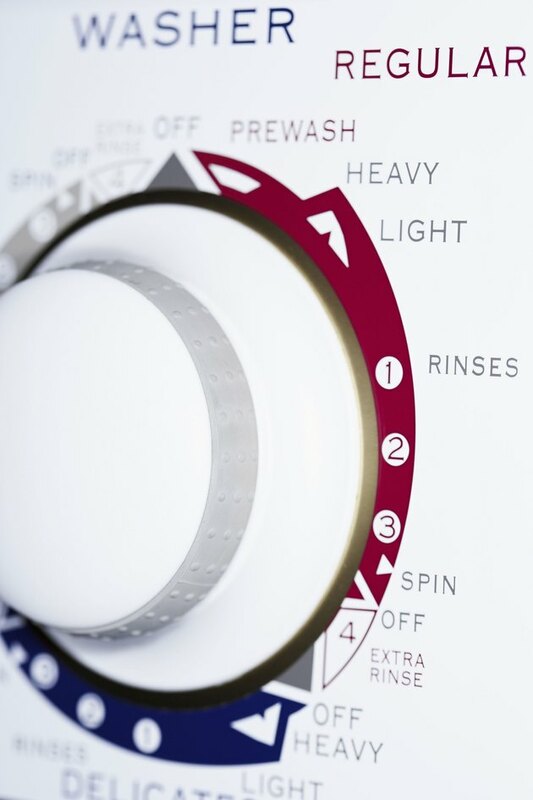 The "Rinse and Spin" setting is used for items that don't need to be cleaned with detergent. In addition to the standard cycles, some machines feature additional settings to help launder clothes. The "Heavy-Duty" setting is for heavy clothing such as jeans and large towels or for laundry that is very dirty and requires intensive cleaning. On some machines, this setting is a substitute for the "Sheets," "Whites" and "Bulky" settings. The "Hand-Wash" setting, which is similar to the "Delicates" setting, agitates gently to protect fabrics that would not normally be put in the machine. The "Steam" setting activates a short cleaning cycle to remove wrinkles. The "Washable Wool" setting is perfect for sweaters, scarves and other wool items that the manufacturer indicates can be washed in the machine. The "Sanitary/Allergen-Removal" setting is used to disinfect fabrics contaminated with germs and bacteria. Terri Williams began writing professionally in 1997, serving as media manager for a large nonprofit organization where she also edited books and created promotional content. She has written extensively on business communication, ethics, leadership, management, education and health. Williams has a Bachelor of Arts in English from the University of Alabama at Birmingham.